Captain Smiley is on the verge of being washed out of the Comic Super Hero business. 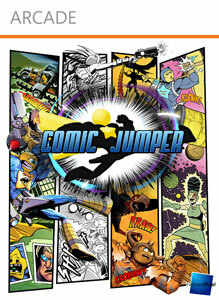 Out of money, and out of villains; Comic Jumper must find a way to reboot his career. Twisted Pixel helps him out (yes they are in the game, literally) by supplying him a device that lets him jump between comics. It is now Captain Smiley’s job to enter other comics and help the heroes in those comics with whatever they need help with… for a reasonable fee, of course. This is not a kid’s game. The art style may seem cartoony, but a huge chunk of the humor is intended for an older audience. There are many jokes within the game from old movies, such as “Total Recall”, “Bloodsport”, and many more that I can’t recall the films’ name; there are even jokes placed in there from other games both their own, and not their own. There are even a few jokes at the expense of their own games, such as The Maw. Simply put, there are a whole bunch of jokes. The humor is spot on and I laughed during the entire game. Sadly, since the entire game depends on the jokes, there isn’t much replay value located in the game. If you do replay it, you will just hear the same jokes over again; and if you are lucky you might catch a few that you missed the first time around. The gamestyle is a sidescrolling arcade shooter. This gamestyle is also a throwback to the older generation. You know, the ones that actually grew up playing these types of games, and not the ones who are used to “More Modern” Shooters. The arcade shooters that were intended to be really hard, and almost impossible not to die in. Comic Jumper is primarily a sidescrolling shooter, where you jump, slide, and climb all while shooting at everything that pops out to kill you. Not getting hurt in this game is almost impossible, as there are tons of things trying to kill you. The bosses are also a lot of fun, with patterns to memorize and tons of health to slowly dwindle down. Freebies are abundant in this game. Twisted Pixel loves to give away as much free stuff as they can, and they have broken boundaries on it before. There are free gamer pictures, a free theme, and even free DLC for their previous game: “Splosion’ Man”. If you thought that wasn’t enough, there is tons of in game concept art, videos, comics to read, and much much more. I say it is all free, but it actually costs in game money that you get by beating levels and challenges; but this is just a small price to pay for so much free stuff. It also adds a small amount of replay value, if you can’t manage to get all the money in one playthrough. There are actually four unique art styles in this game. Even though the overall gameplay style stays consistent throughout the whole game, the art style freshens up the game at regular intervals. Every time there is an art style change, it is like getting a fresh new game to play. It isn’t just the art that changes either, the jokes and the audio change as well. The game’s music was composed by a few different guys, and this gives a unique sound to every different comic. There is even more comedic original music located in this game. More of the awesome funny that only “Chainsaw” can provide. Yes, the same guy that composed “Donuts Go Nuts” from “Splosion’ Man” is back with even more original epicness! Just wait, till you hear Brad’s Theme song, or the other various songs by “Chainsaw”. Also, on a side note, the lipsyncing in this game is horrible; no attempt to even do it at all. On the plus side, the game was so much fun, I didn’t even notice it until I was almost done with the game. It seriously, isn’t that big of a deal. The achievement list in Comic Jumper is actually extremely easy. A large chunk of them can be achieved in one playthrough of the game. You could actually get all of them in one playthrough if you are really good (or bad, in the case of the bullets fired). There are a few tricky ones, however. For instance, “Shut Star Up” only has two locations in the game where you can get it, but you can always go back to those levels and replay them. “Collection of a True Fan” and “I Took Performance Enhancers” both require you to spend your in game money on unlockables and upgrades. If a normal player goes immediately for the upgrades, you can’t get it in one playthrough; on the other hand, if you buy the unlockables, you get a bonus multiplier which keeps adding up based on the unlockables you buy. If you keep buying unlockables, you’ll eventually get a huge amount of bonus cash after each level for simply owning those unlockables. Finally, “Pressed X a lot” is actually missable; and you do not want to miss this achievement. If you don’t go through the base after each mission, you will run out of chances to do it and have to start the entire game over; and you do not want to do that. So make sure to talk to everyone and everything within the base after each mission, until you get the achievement. It does add more funny lines to the game, which is a bonus; and there are also some easter eggs that you might miss unless you talk to them. Neural Net Processors – 10 – Destroy 25 of Brad’s BradBots. Two Stood Against Many – 15 – Complete three sections of the first comic genre. Hero of the Silver Age – 15 – Complete three sections of the second genre. Brad’s Savior and Best Friend – 15 – Complete three sections of the third genre. Job Well Done, Faithful Reader – 25 – Complete the game. Pressed X a lot – 10 – Earn some cash by talking to people in the base. Collection of a True Fan – 25 – Spend your hard-earned money and buy all the unlockables from Dr. Winklemeyer. I Took Performance Enhancers – 25 – Max out all of Captain Smiley’s abilities. Violence Solves Everything – 10 – Fire 125,000 total shots. Eugene’s Protégé – 20 – Play every reaction sequence mistake-free. He Ain’t Even Married – 20 – Survive a specific section without getting hit. Shut Star Up – 10 – Let your feelings guide you. Star Shirt (Male Shirt) – A shirt with star on it, for males only. Gerda Shirt (Female Shirt) – A shirt with Gerda’s Face on it, for females only. Captain Smiley Giant Head – Wear it on your head, and you can be Captain Smiley too. Comic Jumper has a huge emphasis on the in game humor. The player really determines how much they get out of the game. If a player doesn’t catch any of the references, and just runs through the game; the game is in turn going to seem like a stupid piece of junk. On the other hand, if the player takes their time and catches a huge amount of references; the game will be an awesome piece of pure gold comedy! It is as simple as that. In my opinion, the game isn’t really meant to be played, but instead it should simply be enjoyed. Sadly, this also means there is almost no replay value in the game, since you will only hear the same lines over again and see the same things again. I can say that there were a few things I missed the first time through, that I caught the second time but I don’t think I need a third replay at all. If you like Twisted Pixel and like their sense of humor, then you will probably enjoy this game. Sadly, if you don’t have speakers on your TV and aren’t old enough, you won’t like this game that much. Twisted Pixel has even hinted within the game at possible future DLC that they would like to have. This isn’t a guarantee, but DLC supported games are always nice.